An interactive free workshop, open to all! and French. Guaranteed to be informative and fun! “ We are very proud to be presenting this event in our department, at this time when there is so much general interest in the topic’’, says Jack Eby, chair of the Music Department at Bishop’s University. Workshop leader, Eric Akbar Manolson, is familiar to many as the person who organized seven Great Inter-generational Music Festivals in the area, the musical performances at the early Lennoxville Street Festivals and the First Annual conference for English-speaking caregivers in the Eastern Townships . 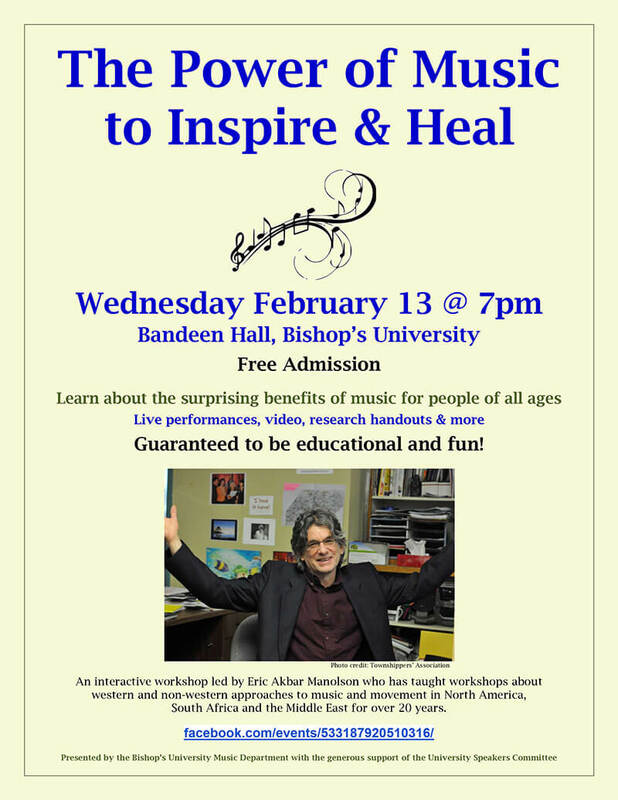 He has taught Western and non-Western approaches to music in hospitals, seniors’ residences and the private sector. He has given workshops in North America, Europe, and the Middle East for over 20 years. Eric is the founder of The Manolson Approach, whose mission is to train people living with Alzheimer’s disease & their families in ways to reduce anxiety, better communicate and see the light in each other’s eyes. Sponsored by the Bishop’s University Speakers Committee, that brings experts to the school to share insights and discoveries in their respective fields. Bishop’s University was founded in 1843, before Canada’s confederation. The Department of Music has been in existence for 50 years and offers programs in classical music and jazz studies.